Our tables and ottomans are made to go with our chairs. 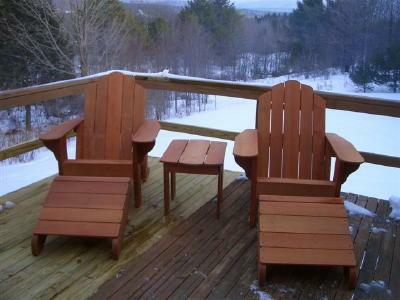 Relaxing an Adirondack chair is truely nice, but when you add an ottoman you will experience a whole new comfort level. You add one now or anytime you wish we highly recommend getting one. We originally had three different tables each built to match a particular chair. This table was made to match our "Charmed" chair that is why it is called the Charmed table. However, it was by far our best selling table as customers used it with all our chairs. Due to the popularity of this table we no longer even make any of the other side tables. We build this top selling table from your choice of Cypress, Mahogany, Red Western Cedar or Ipe woods. The table has a five slat oval top, a three slat bottom shelf and the legs are slightly angled outward for added stability and style. Length 27" Width 17" Height 22"
An Ottoman that can be used as a side table, a stool as well as a footrest. The ottoman is made with your choice of Cypress, Red Western Cedar, Ipe , Treated Pine or Mahogany woods. This Ottoman features four sturdy 2x4 legs and an easy grip handle. Made to use with any of our chairs. Length 15 1/4" Width 22" Height 12 1/2"
Our wedge style Ottoman made to match the "Charmed" five slat Fanback Adirondack chair. Made with your choice of Cypress or Mahogany woods. Easy to move around with cut out handle. 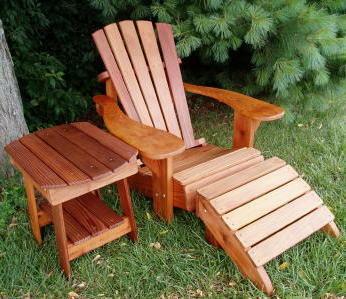 Length 19" Width 22 3/4" Height 13 1/2"
An Ottoman made to match our Classic Adirondack chairs. Made with 5 slats to match the 5 seat slats on our classic chairs. Features our easy to grip handle for easy movement. Made with your choice of Cypress, Ipe, Red Western Cedar or Mahogany woods. Length 22 " Width 23" Height 13 1/2"